Coll. No. 1005, 22 Jul 2013, characters observed while keying: Perennial herb, to 25 cm., rhizomed, growing in muddy soil at creekside; Stem, rooting at nodes; Herbage, glabrous; Leaves, cauline, opposite, sessile, ovate, 35 mm. 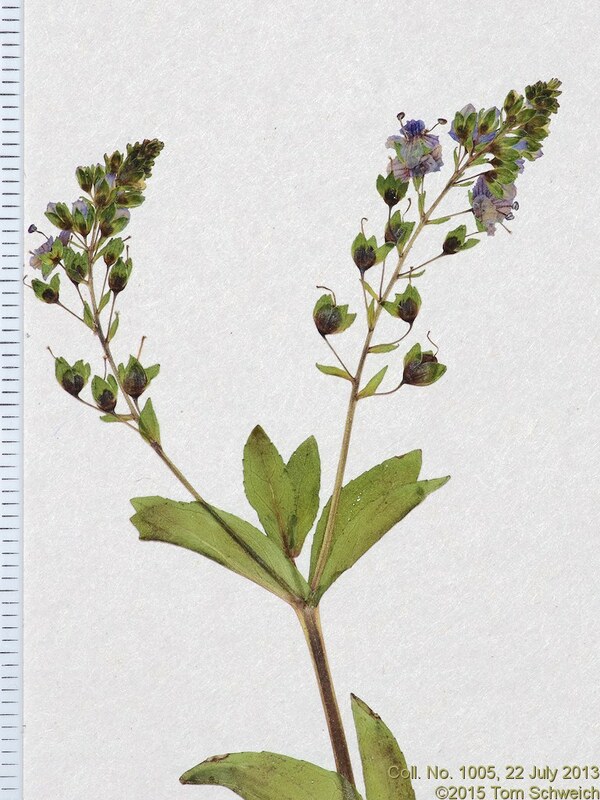 × 14 mm., 2.5× longer than wide; Inflorescence, in opposite axillary racemes; Sepals, 4; Corolla, radial, lobes 4, blue; Stamens 2, staminodes 0; Stigma entire; Fruit rounded (not notched). Field Notes: Coll. No. 1005.